Senate Bill 7052: Oh Decoupling, Where Have You Gone? On Monday, February 24, 2014, the Florida Senate Committee on Gaming presented Senate Bill 7052 for passage, which deals with every aspect of the Florida Pari-mutuel industry. This 453-page bill seems to bring up every subject except decoupling. Right now in Florida, the state mandates that a specific number of live greyhound races must be held at each greyhound racetrack in order for the track to offer more lucrative forms of gambling, such as slot machines and card tables. Decoupling would permit greyhound tracks to end live racing without affecting those other forms of gaming, thus making the ending of live greyhound racing more appealing to track owners. 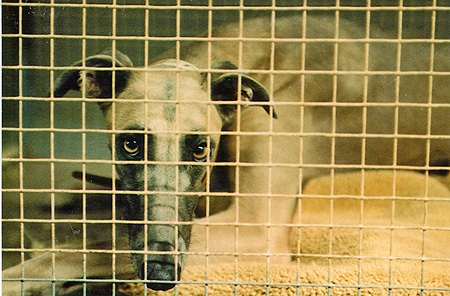 Despite its importance, despite the huge impact it would have on the greyhound racing industry in Florida, despite the even bigger impact it would have on Florida's greyhounds, despite being widely discussed, lamented and argued, it's simply not in the bill. It's not there at all. Has the Florida Senate Committee on Gaming made an accidental error? I think not. The greyhound community, all across the country, must at this very particular moment, rise to the occasion and let Senator Richter and the Gaming Committee know that we expect decoupling to be included in the legislation and we expect it to be passed so that greyhounds will finally have a better chance at life. Let them hear from everyone. Tell your family members, friends, other greyhound owners, animal lovers, your neighbors, your contacts on social media, etc. Tell them all to send Senator Richter a message, via written letter, phone call, fax, or email, to include decoupling into the bill. After all these years it's about time greyhounds got a break.